Do you want to be popular and recognized whenever you receive a call? Then, download Latest Ringtones app and be noticed with these best ringtones ever! Do you follow newest phone ringtones trends? Then, this app is A MUST have! Forget about boring and outdated ringtones and make your phone ring in the latest style. Grab some popular free sounds and you will become the trendiest person around. 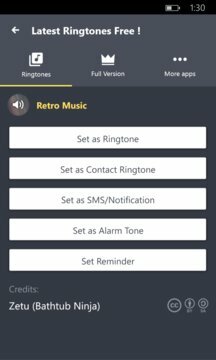 Download Latest Ringtones app and you will have new ringtones soundboard with latest sms tones, notification sounds, alarms and, of course coolest mobile ringtones. Do not miss it! The trendiest and the freshest top ringtones are all here in one place. 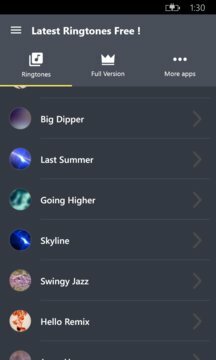 Stay up to date with these cool ringtones and enjoy answering your phone calls. Get Latest Ringtones app for free and stay ahead of trends with new ringtones. This application has been tested on the following phones Windows Phone 8, Windows Phone 8.1: Nokia Lumia 625, Nokia Lumia 925, Nokia Lumia 1520, Nokia Lumia 820, Nokia Lumia 525, Nokia Lumia 1320, HTC 8X, HTC 8S, HTC One M8, Nokia Lumia 520, Nokia Lumia 720, Nokia Lumia 1020, Nokia Lumia 521, Samsung Ativ S, Nokia Lumia 510, Nokia Lumia 928, Nokia Lumia Icon, Nokia Lumia 822, Nokia Lumia 810, HTC 8XT, Huawei Ascend W1, Huawei Ascend W2. Compatible with Verizon, AT&T and all other providers. Sounds and tones used in APP NAME are under Creative Commons license (CC BY 2.0, CC BY 2.5, CC BY 3.0, CC BY-SA 3.0), credited in the app, where appropriate.